A French country writing desk is more than a practical piece of furniture for drafting documents, paying bills or writing quick notes. It's a stately indication of your fashion sense and style. While the wood tones and features vary from one unit to another, nearly all of them have one common denominator: the beauty of the French provincial style. A French writing desk with a modern twist, this two-drawer unit will allow you to easily convert any space into a workstation. With its dimensions of 30.5'' H x 42.5'' W x 23'' D, it may be small and compact, but it's definitely wide enough that you'll be able to write comfortably or work on your laptop with ease. The convenient pull-out drawers will prove useful when you're storing office supplies and making sure certain items are at an easy reach. As for this French country desk's white patina, you can bet it's capable of adding the perfect finishing touch to your home office interior decor. Now this one's a French provincial desk that possesses a good deal of personality. With its solid wood construction, birch top, and elegant silhouette, this masterpiece of a desk allows you to enjoy an office with a sophisticated atmosphere. From that alone, it's already hard not to press that buy button! But, we're not done as the additional storage drawer of the unit makes it the perfect vanity table for your bedroom or bathroom! As it blends splendidly with almost all traditional or classic style interiors, you’ll never go wrong with this stylish, versatile table. This French style desk screams nothing but opulence! It's the perfect writing desk for you if you're an old soul with a love for all things beautiful. The hidden detailing, quality solid wood construction, and authentic metal pulls give the desk the personality that makes it so great at being a statement piece. There's even a ton of storage drawers and cubbies to boot. So, before you think of the best setting for your brand-new romance novel, create your own perfect work setting first with this stately French style writing desk. It measures 41" W x 23" D x 42" H, and it comes with an easy-to-follow guide for its quick assembly. This stunning Angelette Writing Desk from Willa Arlo Interiors is undoubtedly a real eye-catcher! Its wooden frame and mirror panels combined with subtle silver-finished details add a touch of elegance and an Art Deco style to any space. As this piece is versatile, you can use it as your new dressing table. With its mid-century modern and Art Deco vibe, there's definitely no arguing that it's a piece of furniture that represents style, fashion, and taste. Just like the styles this table took inspiration from, it will continue to be trendy and regal at the same time for the years to come. As you are in need of a workstation, consider getting this French-inspired Pinkerton Writing Desk from Lark Manor. It's an option we can recommend for virtually everyone as it has a simple and functional design, which keeps its user focused on whatever task is at hand. This home office piece was crafted from genuine rubberwood and added with silver pulls for the drawer. It features sculptural legs, a single-tone finish, and clean lines that sit well within any interior space. More than just form or style, this French desk emphasizes utility as it comes with storage for stowing away files and writing supplies. Let this table be the go-to spot for when your creative rush occurs. Serene style, cool sophistication, and an understated authority emanate from this French writing desk, a creation of Wholesale Interiors. 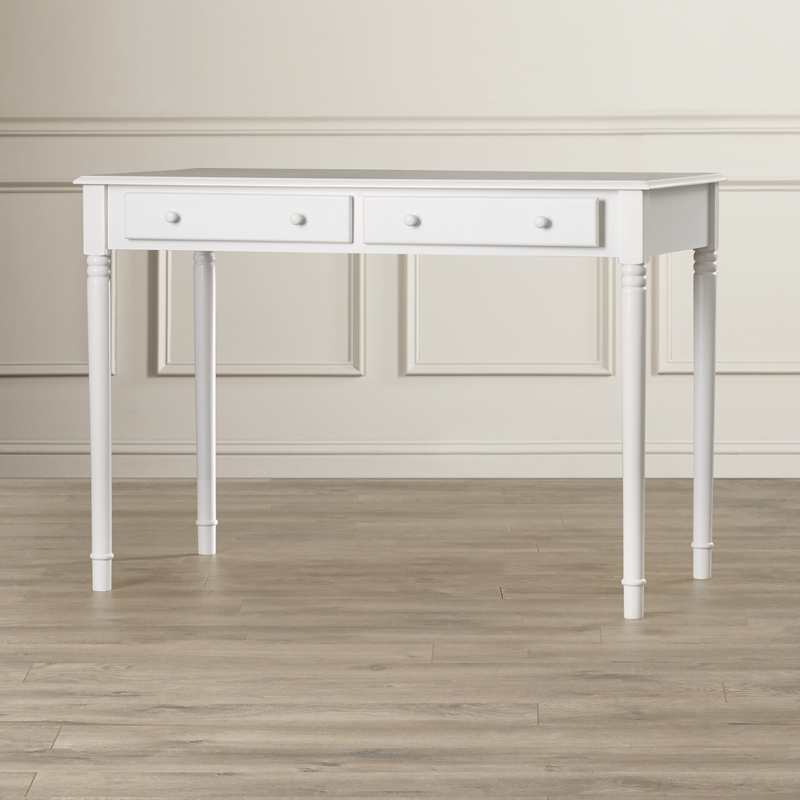 From afar, you already know it's a stylish writing or working surface that's crafted from both genuine and manufactured wood with meticulously carved fluted legs, distressed white polish, and weathered oak top. Every single detail of this desk, including the rustic iron handle, has been carefully taken into consideration to give it its dignified appeal. Furthermore, the storage drawer offers ample room for the storage of gadgets and office supplies. You can also use the storage space for keeping papers, files, and pencils if your technique or style is more conventional. If there's one desk that can easily match a classic farmhouse or traditional abode, then this would be it. Calming balance and symmetry flow over from this French desk's design into your space. It may be just a piece of furniture to you, but it is one that can add your home office a luxurious touch that's inspired by the sought-after Old World styling. This desk features white-streaked natural veneer, mindi wood top, and two spacious drawers to keep your workstation clean and organized. The Geernium 2's gently worn finish gives it its vintage, heirloom-like appeal, which makes the piece fitting to be featured in your traditionally styled home, shabby chic cottage, or countryside manor. As it's rather small with dimensions of exactly 30.2'' H x 39.5'' W x 19.75'' D, it's a French desk that's for residential use only. With French provincial influence, the Audrey writing desk of Beachcrest Home is both beautiful and practical. The exceptional details alongside the soft-colored finish exemplify the piece's European character and allow it to fit a wide variety of home office or living room furnishings. Whether you decide to check off the tasks from your daily to-do lists or express your thoughts on your journal, the Audrey desk will make it easy, chic, and elegant. The storage compartments also keep your pens and paper pads close at hand just in case you come up with new concepts and ideas. Measuring 30" H x 42" W x 24" D, it's the perfect solution for small spaces. You will be drawn many times over to this French writing desk’s ingenious design, vintage-inspired silhouette, and minimalist feel. It's a writing desk that has a generous surface to offer space for writing and working while the drawers sit on metal glides to provide easy access and not just storage space and organization. Crafted using a combination of metal and wood, this desk features a pipe-like framework, dark tobacco and industrial gray finishes, and a stable worktop. Writing, analyzing data, editing, whatever it is that you are doing, you will accomplish it in style with this masterpiece from Trent Austin Design. It even looks as incredible in your entrance or hallway as it would in your workspace! To work your best, it is essential that you have a roomy area where you can put your thoughts into paper. With the Poynor writing desk, you'll have a workstation that features a solid oak surface and a metal frame. It allows you to have recollections on traditional richness and industrial practicality. it even comes with a keyboard tray that offers ample space for your keyword, pens, and supplies apart from keeping technology at ready when it is time for you to work. When you are resting in between projects, the metal bar under your new desk beckons you in finally kicking up your feet. This French desk is definitely functional, fashionable, and capable of bringing everyday style into your home. To ensure you choose the right French style desk from the list you just checked out, consider the person who’ll be using the piece. If you plan on giving one to your daughter for her study area that has a rather small size, you'd want the desk that can fit into the space without taking up too much room. On the other hand, you may need a writing desk that’s French-inspired to add a substantial character to an otherwise empty space. If so, then get the unit that can make the most impact to the room like the French Quarter Writing Desk or the L' Escritoire Secretary Home Office Desk, which also supplies sufficient storage area where bills can be stored while they’re waiting for you to settle them. French writing desks can have a more traditional vibe or one that’s rather contemporary. Which do you think is best for your space? Solid wood with a smooth finish to give emphasis to the graining is usually best for classic/traditional rooms. If that’s not what you want, then maybe you want the updated version of a French provincial desk like the Thetford Writing Desk or the Andrey Writing Desk. Regardless of which style you gravitate to, may it be specialized, space-saving, contemporary, rustic, or classic, make sure that your desk suits your décor. While the primary job of a French writing desk is to offer you a convenient place to sit and work on a task, it has a secondary purpose and that is to offer you storage for office paraphernalia. There's no standard number of storage compartments for writing desks, so your decision will depend on how much storage you need. Some French desks, like the L' Escritoire Secretary Home Office Desk, offer cubbies, shelves, and drawers to accommodate every single one of your storage needs. There are also units with designs that are more dedicated or focused on giving you a work surface area. If you require constant or quick access to materials necessary for the completion of your work like pencils, pads of paper, and folders among others, then you need at least one drawer from your desk. However, you need to ensure the storage compartments added to your unit doesn’t encroach your working space. The best desk with storage still offers ample amount of writing/working area. Price is one of the important aspects you should never forget to consider when getting a French desk. You can save money by getting a writing desk that’s ready-to-assemble (RTA). Although it requires DIY assembly, the RTA units we’ve listed above can be set up in under an hour, which means you have nothing to worry about. To ensure your RTA desk lasts longer, glue the desk’s sides together as you fasten the screws. This technique ensures you have the most durable and stable desk. For desks that come pre-assembled, you won’t have to glue anything. However, it pays to add reinforcements, especially if you have kids that tend to climb up furniture pieces.